Many customers require a specific color for their custom molded plastics. For example, the ‘standard’ yellow used for playground equipment at a schoolyard can be quite different from the yellow in diagnostic equipment, or even office products like bins or trays. Color matching is trickier than what meets the eye. There is an abundance of colors to choose from – nearly 2,000 Pantone colors, to be exact. Understanding the color-matching process can help it move more quickly and efficiently, saving customers time and money. So, how does the color-matching process begin? It starts with a customer providing its plastics manufacturer with a specific Pantone number, an actual color chip or a painted piece illustrating the desired color. The color sample is then sent to an extruder supplier who then sends it to the color house they work with. The color house performs testing on the color and measures it with a machine – very similar to the type of testing they do at Lowe’s or Home Depot with paint samples. Custom colors generally require color matches, which are then assigned a number so a newly created blend can be pulled and used in the future. The color house mixes the custom color with the particular resin that the customer wants to use. This produces a color chip that is sent to the manufacturer for review. The manufacturer keeps one for its own records and sends one to the customer for final approval. If a product goes to market as the wrong color and doesn’t match existing inventory, it can be extremely damaging – and an expensive fix – for any company. 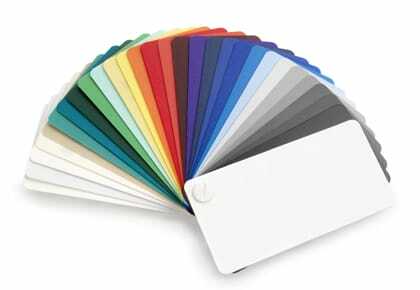 One of the many benefits of creating custom molded plastics is the ability to choose from a variety of Pantone colors. Using a Pantone book, customers can choose any color-specific samples – or create any custom color they need. But, not all colors are priced equally. Custom colors are more expensive, but they can be used to create aesthetically pleasing finished products. As a rule of thumb, black is the cheapest, followed by off-the-shelf white – not to be confused with custom whites, offering customers more than 200 white variations. Also, bright colors will be more expensive, since they need more pigment for color depth and shine. Custom color creation takes time – and customers should plan their production schedule accordingly. This is not an overnight process. It normally takes about 10 business days to work with the extruder and color house. The color approval process with customers really depends on how quickly the color houses can provide the sample back to the manufacturer, and then the customer. It’s critical to understand that color variations occur based on resin, substrate, and material. There is a chance that the Pantone could look different on different materials – and if the customer is not happy with the final color result, the color-matching process will need to be repeated until it’s correct. Many times, in the plastics industry, large batches are much more cost effective than smaller batches or one-offs. If a large batch is purchased, there can be a huge loss of money and time if a color is not correct – so it’s imperative to spend quality time on the front end of the process to ensure the color is right. Color variations really depend on the type of resins being used in the plastic. Color will look differently on an Acrylonitrile Butadiene Styrene (ABS) resin compared to a polyethylene resin. The thickness, type of material, additives in materials, and the resin itself affect the color. As you can see, there is a lot to consider when going through the custom color process for plastics. Understanding the color-matching process, choosing the right color, allowing adequate turnaround time, and recognizing material and batch considerations are all important facets to move through the process efficiently and effectively – helping to save you time and money. If you have questions or would like to discuss the custom color process, please contact one of our experts.